Addendum to an earlier post, regarding attempts to photograph a clear vinyl lathe cut disc by experimental/noise musician James Twig Harper. ...there are two "tracks" -- one on each side of the disc. The bands of grooves on each side are lined up un-concentrically relative to each other, which you can see because the disc is clear. One of the punch holes lines up concentrically with a track on one side and the other punch hole lines up concentrically with the track on the other side, making each side playable on a turntable. The vinyl slab is crudely cut into an irregular polygon. The photos in the earlier post were my attempts to document a copy of the disc "in hand," as they say on Discogs. The images above are the efforts of another Discogs user, TheRealTannerG, to document his own copy (his photos are tweaked a bit and cropped here). 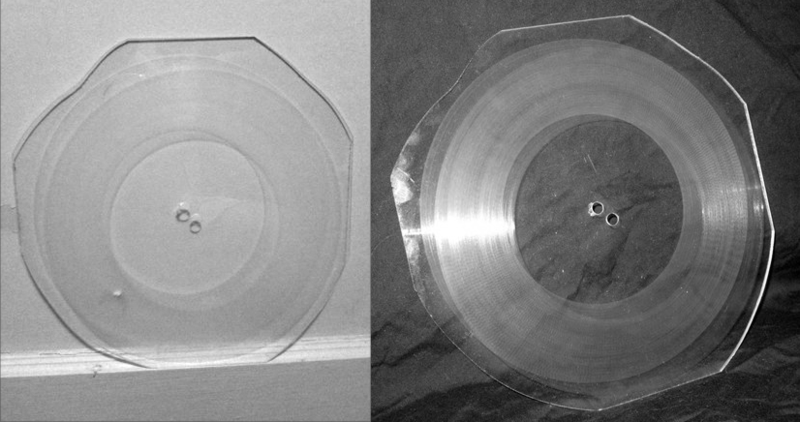 The two discs, supposedly from the same edition of 20, are superficially alike but also have many differences (widths between punch holes, overall shape, placement of record grooves). Discogs' entry for the disc describes it as "Untitled" and dates it 2012. From this it appears the title of the work isn't "Untitled," but "Double Offset 2." There is no explanation for the differences in the photos of the two discs, which we'll have to take on faith are even from the same edition. Nevertheless, the discs, as captured in these photos, have a certain seductive quality as sculptural-objects-mediated-through-photography, as punk artifacts, and as visual representations of sound (i.e., an idea of how sound might be presented and preserved).